In some of Earth’s most extreme environments — Antarc- tica’s frigid ice fields, Yellowstone’s sulfuric hot springs, Crater Lake’s lightless depths, the oceans’ deep-sea basalts — Stephen Giovannoni has discovered thriving communities of bacteria. 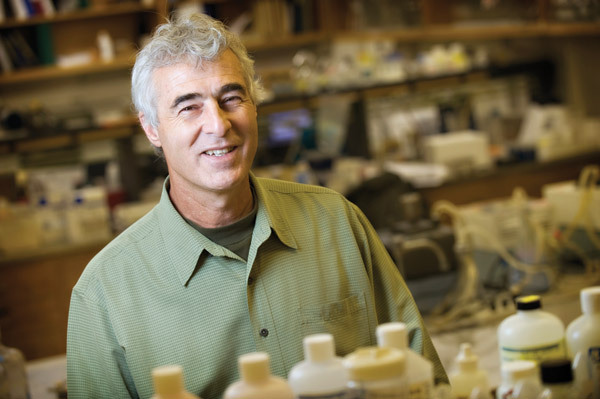 As the holder of the Emile F. Pernot Distinguished Professorship in Microbiology, he has discovered some of the most abundant life forms on the planet. Microbes are masters of adaptation. About two decades ago, the Oregon State University micro- biologist went looking for microscopic master-adapters in yet another place thought to be inhospitable to life: the clear, still waters of the Sargasso Sea south of Bermuda. There, he made a remarkable find. Not only do bacterioplankton (ocean-drifting bacteria) live in this sea once considered a desert, they’re everywhere. It turns out that this newly found branch of bacteria, named SAR for the Sargasso, is among the most plentiful — and thus evolutionarily successful — life forms on the planet. After this astounding discovery in 2002, Giovannoni’s lab devised novel technologies for growing these kinds of extra-tiny organisms without Petri dishes. Using gene cloning and DNA sequencing, he and his colleagues have so far sequenced 27 hard-to-grow microorganisms never before described. They have shipped samples to scientists all over the world. To figure out how marine microbes compete for and adapt to spatial, temporal and seasonal niches and how they contribute to the cycling of carbon in the oceans, Giovannoni is looking at every- thing from marine snow (carbon-carrying particles that sink into deeper ocean layers) to spring upwelling and summer stratification to species richness (total species in a sample) and surface warming. For information about supporting research and teaching through faculty endowments, contact the Oregon State University Foundation, 1-800-354-7281 or visit CampaignforOSU.org.